So, I finished another project! I mailed this one out last week, and I'm pretty sure that it's arrived by now so I can post some pictures and it won't ruin the surprise. This blanket was knitted for friends of mine who are expecting a baby boy any minute now. 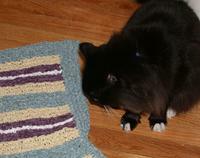 It was knitted with double-stranded chenilled on size 13 needles. It's all garter stitch, which makes it good TV-watching knitting. It's this pattern from my LYS. When they printed out the pattern for me, it said that I should use size 13 needles instead of size 11 (like it says on the website). As you can see the stitches are pretty big, especially given that it's for a tiny baby with tiny fingers and toes. If I had to do it over again, I'd use the smaller needles. Also, I didn't use Crystal Palace for the blue and yellow yarn. I didn't notice any real difference between the two brands of yarn, except that in the pictures that used a flash the blue and yellow yarns appear to be glitter-y. The blanket is super swell! Hopefully we will have a baby to stick under it any day now!! Thanks! !